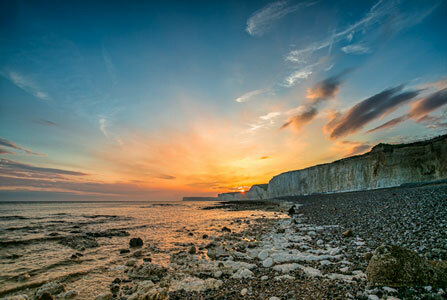 Graham lives in Eastbourne and has been photographing the beautiful local countryside and coastline for several years. He is the official photographer for Eastbourne Tourism as well as preferred photographer for the many events and attractions which occur throughout the year. As well as his beautifully observed images of Eastbourne and the ability to tell a story through his pictures, Graham has also won many awards and competitions for his own particular style of photography, in particular, his work with macro and liquid media. We are pleased to be able to offer a small selection of his work, not only as memories of Eastbourne but also as art pieces which will grace any home. All photos are hand-printed by Graham using professional pigment inks and 270gsm Oyster paper. Images are sized at 360mm x 240mm with a generous border to allow for mounting and framing and despatched in a strong protective cardboard tube to ensure total protection in transit. Each photograph also includes a signed adhesive label for inclusion on the back of the frame showing title and year taken. Cost of each photograph is £30 and UK P&P will be £4.70. International order postage will be £7.50. If this is a personal purchase and you are a UK taxpayer*, Graham Huntley Photography can increase the value of your purchase without costing you a penny. If you tick the 'Reclaim Gift Aid' box and fill in your full name and home address details, Graham Huntley Photography will be able to claim at least 25% extra from the Government on top of your purchase made through Visit Eastbourne. Your name and address will be forwarded to Graham Huntley Photography in this case to allow them to claim the Gift Aid. *You must have paid UK tax this year at least equal to the 25% Graham Huntley Photography will claim.